As Hamlet noted, a play can play a significant role in stimulating the conscience – even one that may or may not be possessed by a king. So the month of June in Sydney (elsewhere later) seems to have been chosen by some serendipitous power to catch the conscience of Sydneysiders regarding various unhappy aspects of Indigenous life in this country. Stolen Generations, massacres and youth suicides are all tackled, though the results are not necessarily as bleak as that sounds. For the potential pricking of our consciences is leavened with comic excess, inspiring movement and moving vignettes of torn youthful feelings that seemed to work effectively on a mainly school audience at Parramatta. That was in the 20th-anniversary production of Jane Harrison's 'Stolen' by the cheekily named National Theatre of Parramatta. Was it really 1998 when I first saw this at Belvoir, in a much dourer production by, I believe, Wesley Enoch, now running the Sydney Festival? Were the characters then played a little older? For the five actors on stage – all Indigenous and four from Queensland – do all have youthful characters as the victims of Stealing, residents in some remote Children's Home, often told that their mothers are dead, lined up in beauty parades for possible fostering, and steadily de-tribalised from the families they've lost. But sometimes, confusingly, they also play the parents who've either lost them or gained them as fosters/adopters. The play and Vicki van Hout's production is very physical – she's also a choreographer. That, combined with the pains and hopes of its young characters, clearly held a youthful audience – for whom I believe it's a set text. It would be a hard text to encompass. But in the hands of an actor like Erub Island's Berthalia Selina Reuben, the repetition of the moment she returns from a weekend 'out' clutching a doll and a secret she can't tell - “Do it for me, Ruby,” eventually slips out on the third repetition – and I was almost in tears at this delicately drawn evidence of abuse. There are also two bitter-sweet traditional stories in the play – the Tale of the Munji and the Creation Story of Desert Sand. Both have ironic conclusions that link to the main plotline of the play. But it's good that Harrison, the child of a woman with Murrawarri and English ancestry, who escaped Stealing because, in good ol' racist Oz, her Mother was white and therefore capable of making her own mind up, was able to take the play out of the cities into more traditional areas. However, the end of the play denies much that has gone before in its positivity. One Stolen mother, now a grandmother, at last has a baby to hold after 25 years of denial. A Stolen child declares she is “Going home”. But we've seen plenty of evidence that 'home' may just as likely be the white household that's nurtured her as the Black one she's never enjoyed. Which is their 'real' family? The set is dominated by a colourful Tjanpi woven tree, and the furniture is all cardboard. Highly appropriate for such impermanent lives, and also for the show's touring – which 'Stolen' will do to Orange, Griffith, Cessnock, Tamworth, Byron Bay and back to Sydney throughout June. Could 'Blackie Blackie Brown' tour? 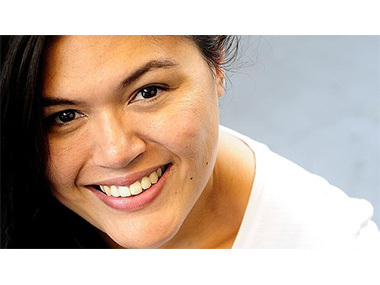 Nakkiah Lui's outrageous comic show at the Wharf Theatre has a set of technical complexity and a text of utter political incorrectness that might not survive outside Sydney! And it's just possible that, as the avenging BBB (the person, and not to be confused with the KKK) goes about killing in ever-more varied ways up to 400 descendants of the men who slaughtered her Great-Great-Grandmother, the message about the evils of genocidal massacres in Australia may have got a tad lost. But in Sydney, I have to say the audience cheered BBB's excesses on. A teenage boy in front of me had hysterics as inflated testicles and dildos loaded with the ashes of the dead made their appearances. And who could have resisted the transformation wrought in Megan Wilding from mild-mannered archaeologist to mighty murderer of the innocent (and not so innocent) offspring of the 19th Century trio – especially a cop called Hurley? But who could actually follow a sub-plotline that seemed to involve a drug – or was it a machine - that transformed Black women into white men???? All this mayhem is achieved by just two performers – Wilding and Ash Flanders; two totally disparate body-shapes, though the latter is an amazing shape-shifter as he dies a hundred different deaths. They are critically supported, though by the digital cartooning which brings Elaine Crombie's Great-Great-Grandmother along on screen whenever BBB needs encouragement, and by the techno-tricks of Peter Carroll's politically incorrect computer, ACOON, voiced in full Hal mode. Declan Greene directs, and the show runs through June, if the cast don't die of exhaustion! Finally, coming up at the end of the month is the return of 'Gudirr Gudirr', which played the Sydney Festival a couple of years ago. This solo dance work from Broome's message is mixed. It brought back happy memories for me of the first appearance in 1997 of a confident Josie/Ningali Lawford from The Kimberley, I was almost as blissed-out as performer/creator Dalisa Pigram was at the end of this one hour show. But we've moved on – or should that be backwards - in the last 19 years. While Lawford made the positive case that as long as she retained her language, she could take on the white world as she chose, Pigram is much more cautious about the protection offered by her Yawaru language. She's seen too many suicides and felt the imminent threat of miners' encroaching on her Kimberley Country to be confident of a happy outcome for her people. 'Gudirr Gudirr' is at the Sydney Opera House Studio from 27 to 30th June. 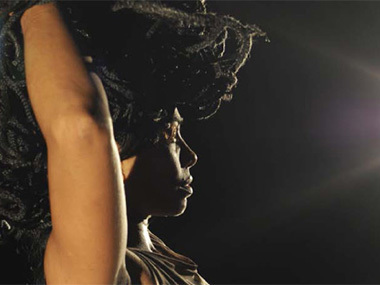 Yawaru dancer/choreographer Dalisa Pigram from Broome blisses out in 'Gudirr Gudirr'.